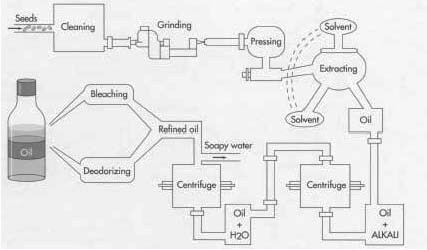 Edible oil manufacturing process is a very professional process which always includes the following procedures, they are raw material pretreatment, oil pressing, oil extraction with solvent and oil refining. First of all, Raw materials should be removed of all external material. 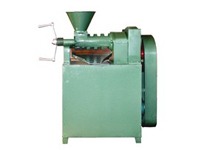 If you want to process cotton seeds, the ginned seeds have to be stripped of their lint along with dehulling. 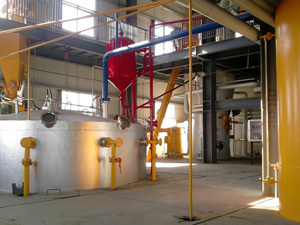 If you are going to press corn oil, the corn germ must undergo pressing to separate the germ. The stripped seeds or nuts are then ground into coarse meal to provide more surface area to be pressed. The meal is then heated to facilitate the extraction of the oil. While the procedure allows more oil to be pressed out, more impurities are also pressed out with the oil, and these must be removed before the oil can be deemed edible. Last but not the least, crude oil refining is also important in the edible oil manufacturing process if you want to produce oil for edible uses. The oil is refined to clear out color, odor, and bitterness. Oils are degummed at the moment by treating them with water heated to between 188 and 206 degrees Fahrenheit (85 and 95 degrees Celsius), steam, or water with acid. The gums, most of which are phosphatides, precipitate out, and the dregs are removed by centrifuge. Finally, the oil is deodorized. In this process, steam is passed over hot oil in a vacuum at between 440 and 485 degrees Fahrenheit (225 and 250 degrees Celsius), thus allowing the volatile taste and odor components to distill from the oil. Anytime you are fascinated with the edible oil manufacturing process, it is important to e mail us today and you will probably never regret doing so.